Guns and Roses. 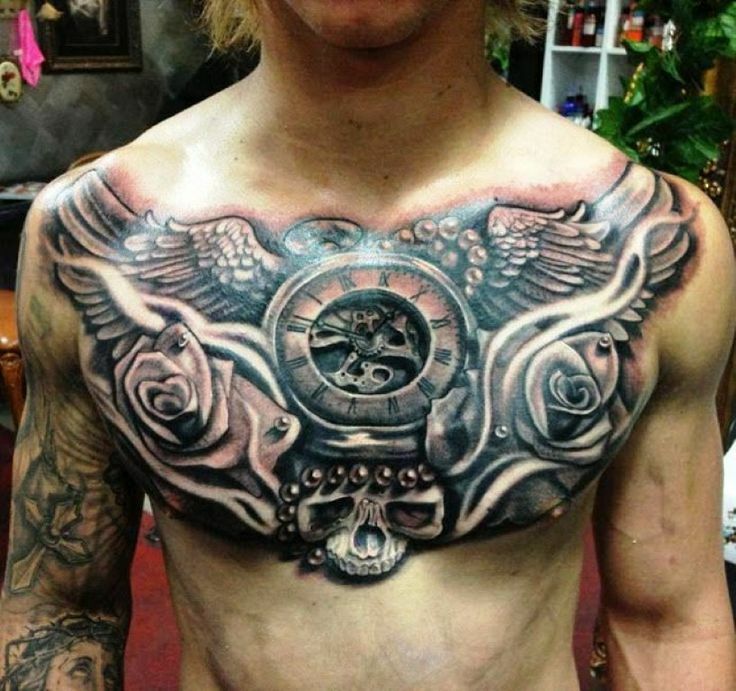 Lord Have Mercy speaks volumes to those that might consider rabbling into this chest tattoo. The vibrant and spellbound rose at the center is surrounded by a pair of old time shooters elegantly placed across the chest. The Guardian on Patrol. This hooting foul spreads his wings to sore through the night and sneak up on unsuspecting prey. The talons are ready to meet anything that should enter his path to make a delicious nighttime snack. Full on Folly. 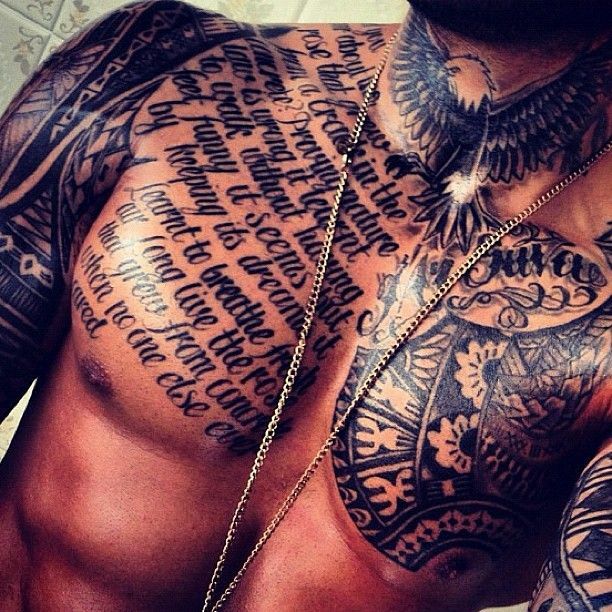 There are details beyond details in the full upper body wrapped classic tattoo. Punk Rock steals the eye above a perfectly centered diamond surrounded by roses that are contoured. The design flows from one extreme to the next and carries the viewer without disruption. 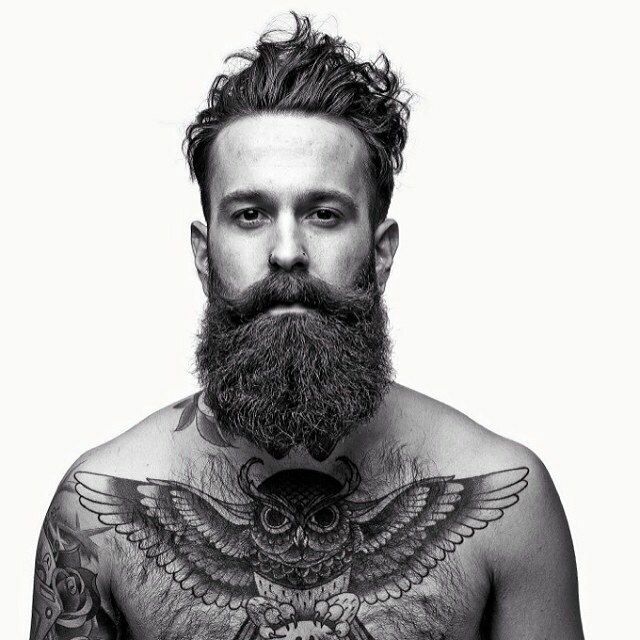 This is one of many chest tattoo ideas for men. Time Stops for No Man. An incredibly assembled feast for the eyes. 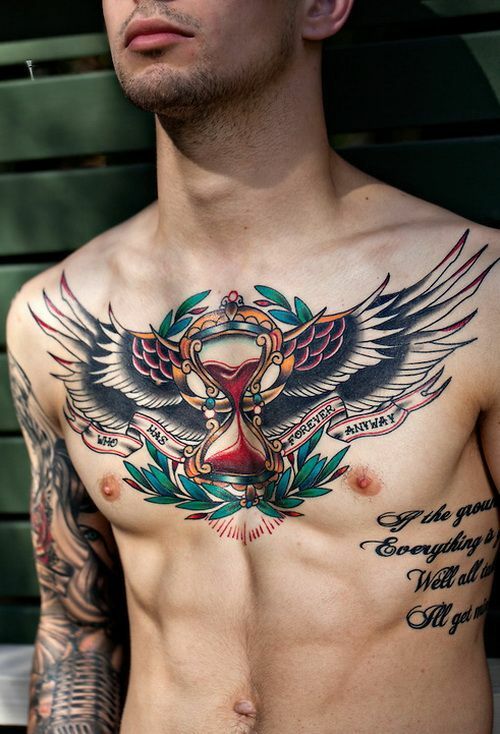 The broad and beautiful tattoo brings color hues and variety to a whole new level. The intricate clockwork is the center focal point with depth that defines the artist’s pure and true talent. The Pumping of the Heart. This tasteful and original work brings us to the realization of how much one man can give. 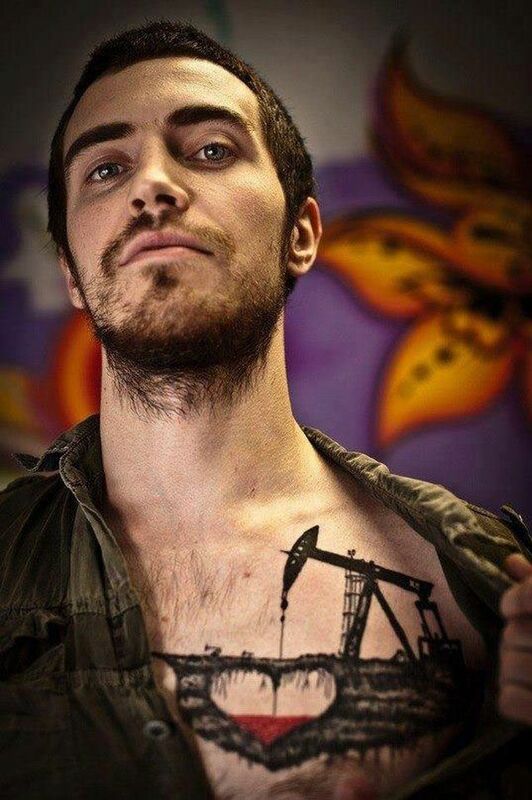 Oil rigging of the heart’s blood is a bold and beautiful way to depict and share the never ending and nonstop pumping of a man’s lifeblood. The Vibrant Soldier of Color. Many pieces and parts to this scheme of art. The flora, feathers and décor are combined to bring the eye to wondrous heights of viewing pleasure. Side anchors lead to grounding and sleeve art takes flight. The Rose that Grew From a Crack in the Concrete. 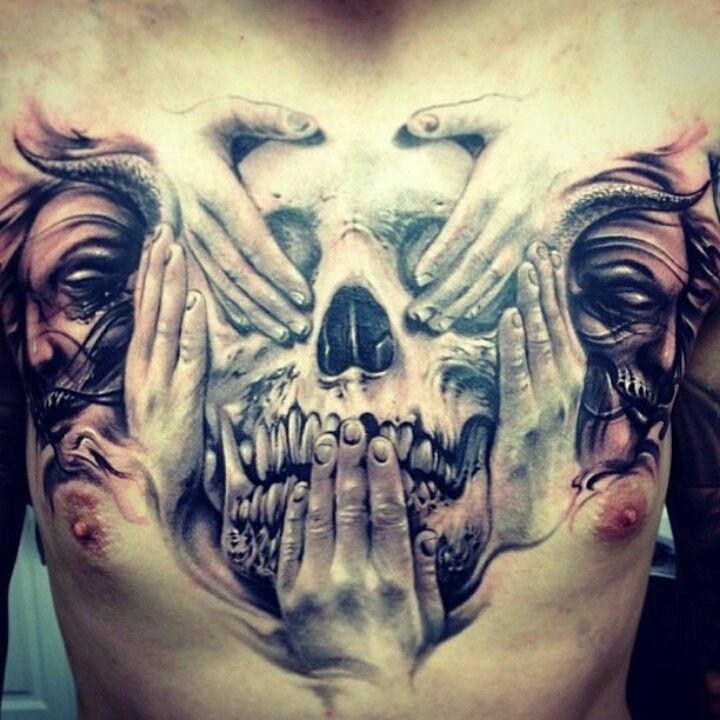 A feast for the eyes exists in the bold and detailed full sleeve and chest art of this spectacular vision. The eagle expresses his gallant wingspan in awe of the tale that is shed. Speak no evil, See no evil, Hear no evil. A brilliantly prescribed version of the what is hailed to be a virtue in the eyes of men. The outer layers of humanity are exposed to teach this long lived value. Who Has Forever Anyway. The colorful work of art displays time as every changing, growing and altering life around us. There will be an end to all and there is no way to elude it. Appreciate the moment you are in and let it be tattooed on your heart to hold onto. Roar from Within. 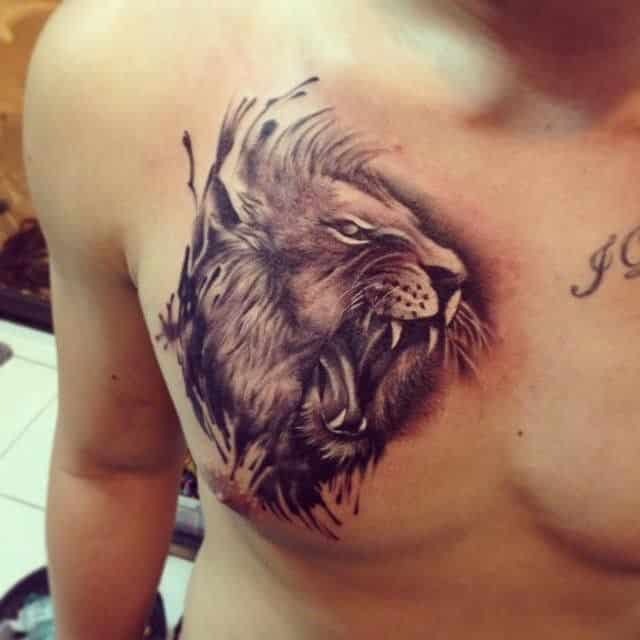 The detailed lion head erupting from the right side of the chest announces his forthcoming strength and pride. He exposes his head to call upon the need to be heard and known. He could only be tamed for so long and now he is freed!